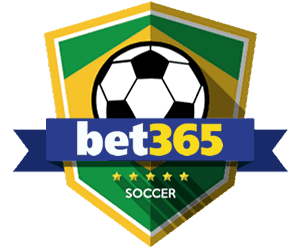 Your guide to Everton FC in the 18/19 Premier League Season – Betting Odds, Fixtures and Match Previews. 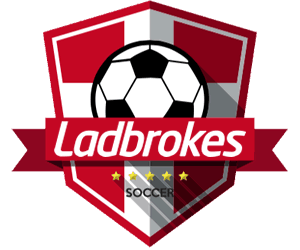 Odds on Everton FC winning the Premier League no longer available (Betfair) updated 4th February 2019. Founded in 1878, Everton holds the record for competing in the top league in English Football. They have been in the top flight for a staggering 114 years and were founding members of the Football League in 1888. It would be two years into the infancy of the football league before Everton would win their first league title and they have since gone on to win the title nine times, the FA Cup five times and the European Cup Winners Cup. In their long History, Everton has had a number of periods where they dominated the league, just take a look through the Gwladys Street hall of fame and it is clear to see the talent that has pulled on the royal blue jersey. But one thing stands out when you take a look at the hall of fame and that is the number of players from the mid-eighties and there is a very good reason for this. The late seventies saw Everton languish around the bottom half of the table and then in 1981 a former player Howard Kendall was appointed the manager and Everton went onto have their greatest ever period of success, winning the League title two times, the FA Cup in 1984 and the European Cup Winners Cup in 1985. Kendalls fantastic teams were full of talent, legends like Peter Ried, Andy Gray, Graeme Sharpe, Trevor Steven, Pat Van Den Hauwe, Gary Lineker and the great Neville Southall took Everton on a blazing path. The number of titles and cup wins to the Kendall era does not quite do the team justice as they narrowly missed out on a number of titles and Cup Finals, also the expulsion of English teams from Europe after the Heysel disaster took away Everton's chances of more European glory in a period where they could easily have taken more European silverware. Since the start of the Premiership in 1992 Everton have not been able to repeat the glory years of the Eighties, with a succession of managers coming in to try to bring the club back on track. David Moyes kept the club on a steady road for ten years between 2002 and 2012 and the club saw glimmers of hope in players like Wayne Rooney who went onto become arguably one of the best footballers England has ever produced. Rooney and Moyes both went to Manchester UTD and Everton have promising periods with Roberto Martinez and Ronald Koeman at the helm. But both managers could not quite meet their potential and last season brought a brand of football from Sam Allardyce that the fans were not happy with at all. Marco Silva was promptly brought into the club at the end of the season and with that, there have been some solid signings like Defender Lucas Digne and Striker Richarlison with more in the pipeline, let's see if Silva can bring some silverware back to Goodison. The Everton fans had a bit of a rollercoaster ride last season. Ronald Koeman had a disastrous start to the season and when he was sacked, caretaker manager David Unsworth did not do much better. Sam Allardyce turned things around but it was too late. The appointment of Marco Silva as new manager, plus a host of new signings could place them well for a top six place. Odds on Everton finishing in the top six (Betfair) updated 4th February 2019. Odds for EPL Team of the Year – Goalkeeper. (Paddy Power) 01st August 2018. Jordan Pickford signed for Everton in 2017 and had an amazing season for the Blues, becoming player of the year. He set himself up to be selected for the 2018 World Cup in Russia and instantly became a hero of the tournament after saving a penalty against Columbia in a shootout that saw England win their first ever penalty shoot-out in the World Cup Finals. His confidence will be high and a great season could be ahead for Pickford. Marco Silva was appointed New Manager of Everton at the end of last season after the dismissal of Sam Allardyce. Silva has some serious questions over his capability in the Premier League, he managed Hull in 2016/17 who were relegated. He went to Watford last season and started well, but things changed after Everton showed interest mid-season and Watford sacked him in January. The Everton fans will not put up with a bad start and he could be the first to be shown the door. Odds on Marco Silva being the next Manager to be Sacked. (Paddy Power) 4th February 2019. 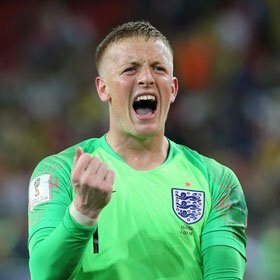 Jordan Pickford has become an instant England Hero after the World Cup. To say that he had an amazing tournament is an understatement – he made an incredible save in a penalty shootout against Columbia to lead England to their first penalty shootout win Ever. He signed for Everton last season and forced his way to be the number one choice in the nets for Everton – ending the season being awarded the player of the year. There has been lots of interest from other clubs after the World Cup, but let's hope he stays at Everton this season as his confidence will be running at an all-time high and could be the key to Everton targeting European Football next season. 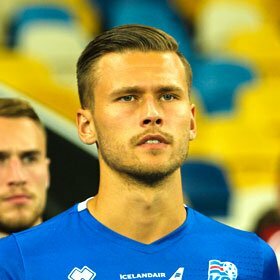 Born in Reykjavik Gylfi plays for the Iceland National Team and will be raring to go after the World Cup in Russia. He is a supremely talented attacking striker who was a record signing for Everton in 2017 at 45 million pounds. Playing for Swansea he was voted Player of the Year two seasons on the trot. Having suffered a knee injury last season he will be looking to make his mark this season, capable of scoring spectacular goals Gylfi Sigurdsson could be the key to a great season for Everton if he switches on his magic. 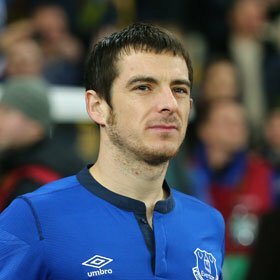 Leyton Baines was born in Kirkby and has been a die-hard Everton fan since his youth, he was on Everton's books as a teenager and since signing for the Toffee's over ten years ago he has firmly placed himself as one of the greatest players to don the Blue shirt. Having made nearly 400 appearances in defense for Everton he is an integral part of the team, he also holds the record for leading scorer from the penalty spot. Baines has been voted Players, Player of the Year on numerous occasions and holds the record for the most number of assists by a Defender – there is no doubt that he will want to perform this year with the new signing of Lucas Digne from Barcelona. Defensively Everton look great going into the 2018/19 Season. The 2017/18 season started off with great hopes from the Everton Fans after a solid performance the previous season, where Ronald Koeman guided the team to seventh position and put Everton into the Europa League qualifiers. Romelu Lukaku had moved to Manchester UTD for a huge sum and in exchange, Wayne Rooney came back to his childhood club, on top of this there were key signings such as Jordan Pickford and Gylfi Sigurdsson. What happened next shocked most of the footballing community as Everton had more than a rocky start to the season, by October they were way down in 18th position and looked like they were staring down the barrels of the relegation gun. After a shocking defeat to Arsenal, Koeman was shown the door and this decision maybe would have been better made sooner as he was already falling out with a number of players. David Unsworth was made the caretaker manager but negotiations to find the new manager became a bit of a shambles leaving Unsworth in charge for eight games. Eventually, Sam Allardyce was brought in on a contract for the rest of the season and a seven-game unbeaten run managed to drag Everton out of the relegation struggle. However big Sam's tactics and his reaction to the fans did him no favors at all and even though they finished eighth, Sam was also shown the door at the end of the season. The Everton team of 1985 was easily one of the greatest Everton teams of all time, blessed with talent all over the pitch and with one of the best Goalkeepers in the world protecting the nets they dominated the league and finished with 90 points, 13 points ahead of runners-up Liverpool. Howard Kendall's glorious team walked away at the end of the season with The Charity Shield, The European Cup Winners Cup and The League Title – if you want to re-live this glorious time you can purchase the shirt below. Everton has always had a loyal fan base, in a city of two legendary teams a true blue fan will always stand by their team. 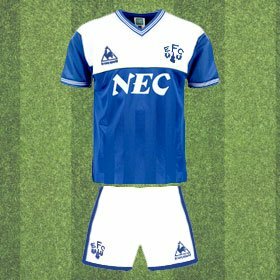 There has been some great designs of the Everton kit over the years and footballing legends have proudly stepped out onto the field with the Everton crest close to their hearts. Sometimes the most iconic shirt to wear is the current shirt and display your loyalty to the team of the day – this seasons kit is a classic design that is timeless and if you want to show your support click below to get your shirt. 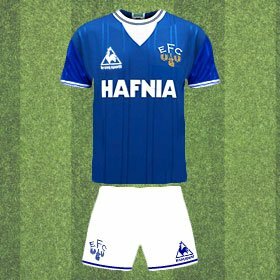 The 1984/85 Everton team was fantastic and they had the greatest season ever, but the 85/86 season produced something iconic. Enter the great Gary Lineker, who was brought in from Leicester and was facing a difficult task winning over the fans as he was replacing Andy Gray. Lineker had an epic twelve months winning multiple awards and took England on a blazing trail in the World Cup. 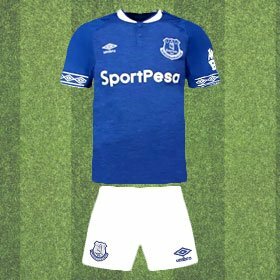 Everton will see this season as a great season even though they missed out on the title and the FA Cup to Liverpool – fans will look at this shirt and instantly remember Lineker blasting the ball into the net for Everton. Click Below to get your shirt today.